The Nigerian Army yesterday said it killed 10 Boko Haram insurgents during an operation at Ngelkona in Ngala Local Government area of Borno state. Col. Onyema Nwachukwu, Deputy Director Public Relations Theatre Command Operation Lafiya Dole, disclosed this in a statement released in Maiduguri. Nwachukwu said that the operation was conducted by troops of 153 Task Battalion with support of the Cameroonian Defence Forces deployed in Operation Lafiya Dole at about 11:30 a.m.
“The terrorists, who were mounted on horse back were overpowered by the troops in a fierce shoot out, as the gallant troops killed the insurgents and captured two AK 47 rifles from them. 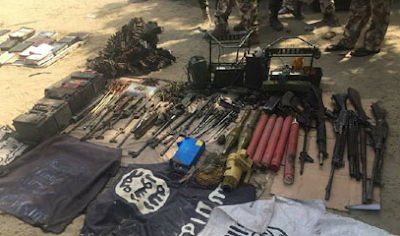 Other items recovered from the insurgents include one Boko Haram flag, a set of bow and arrows, two mobile handset. and one Cameroonian International Passport. “In a separate clearance operation, troops of 82 Task Force Battalion of Operation Lafiya Dole yesterday in a night attack routed fleeing elements of Boko Haram insurgents at Ngoshe in Gwoza Local Government Area. “During the attack, troops killed one insurgent and recovered one AK 47 rifle, 41 rounds of locally fabricated ammunition and four Improvised Explosive Devices(IED). The recovered IEDs have been safely defused by the Explosive Ordnance Disposal team he said. “In another operational encounter, troops of 27 Task Force Battalion of Operation Lafiya Dole, on a long range fighting patrol, Friday 1st June 2018 successfully conducted a raid operation on Boko Haram camp in Yaridiri forest in Geidam Local Government Area of Yobe state. “During the raid, the superior fire power of the troops forced the insurgents to flee in disarray with gunshot wounds, abandoning a huge sum of money and several other items,”said He added that the troops also recovered three AK 47 rifle magazines, 21 rounds of 7.62 mm (Special) ammunition, a motorcycle and two mobile handsets. According to him, the troops also recovered the N2,280,000 from the hideout.